If you have ever seen branching corals spreading their arms out like tree limbs, you can see why early scientists thought corals were plants. But these tiny, soft-bodied creatures are carnivores, despite being sessile, or fixed to one spot. Like their relatives, the jelly fish and the sea anemone in the Cnidaria phylum, each individual coral, or polyp, has barbed, stinging cells called nematocysts it can extend to capture prey like zooplankton or small fish. Although those early scientists got it wrong, it’s easy to understand their mistake. Coral almost could be considered half-plant because of the zooxanthellae (pronounced zoo-zan-thelly) algae that live just inside each polyp’s cell walls. 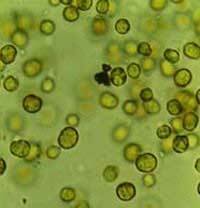 The zooxanthellae supplies the polyp with the byproducts of photosynthesis, which the polyp turns into proteins, fats and carbohydrates. In turn, the polyp shelters the zooxanthellae and provides the carbon, nitrates and phosphates the algae need for photosynthesis. Up to 90 percent of the energy produced by zooxanthellae’s photosynthesis is transferred to the coral host This mutually beneficial arrangement is called symbiosis. Thousands of individual polyps cluster together to form this single branching coral. Coral polyps also use the energy supplied by their symbiotic algae to produce calcium carbonate, or limestone. They secrete the limestone from their base, creating a protective skeleton and a hollow chamber called a cup. The polyps retreat into their cup to hide when predators come looking for them. Polyps rarely exist alone. They usually join other polyps to form a larger colony that acts as a single organism. While the individual minuscule polyps grow to 1 millimeter to 3 millimeters on average, colonies can weigh tons. Even a single branching coral comprises thousands of individual polyps. Over hundreds or thousands of years, these colonies may connect to form a reef. Reefs grow in one of two ways. One way is to periodically add on to their limestone base. They simply secrete more calcium carbonate under and around their current cup, creating the framework of the reef and causing it to grow both upwards and outwards. They also grow by reproducing. Corals may reproduce either asexually, by dividing and producing identical clones, or sexually, by sending out eggs or sperm. Either way, new coral polyps settle towards the ocean bottom until they find a hard substrate to call home, either combining with a pre-existing coral colony or starting one of their own. In addition to being connected at their bases, coral polyps link to one another laterally by a thin tissue called the coenosarc. The coenosarcs and the polyps form the visible living part of the reef, while the limestone base forms the non-living part. In the next chapter, you’ll learn more about the structure of a coral reef and find out what conditions they need to survive. 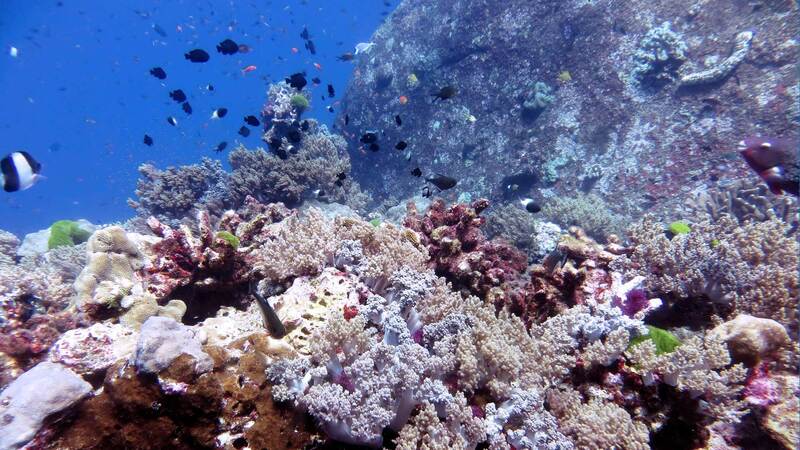 You’ll also get a look at the different kinds of reefs. 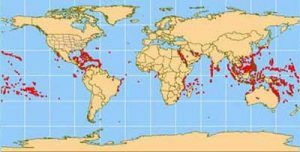 Coral reefs around the world Coral reefs, indicated by red dots, are found predominantly in tropical waters 30 degrees north and south of the equator. In addition to sunlight and warm water that does not drop below 64.4 degrees Fahrenheit (18 degrees Celsius), reefs require saltwater environments with a specific salinity. As the map indicates, the majority of reefs are located in the Indian and Pacific oceans, which meet these conditions. On sunny days, coral can build calcium carbonate twice as quickly as on cloudy days. Even at 3.9 inches a year though, a well-developed reef can take thousands of years to form. 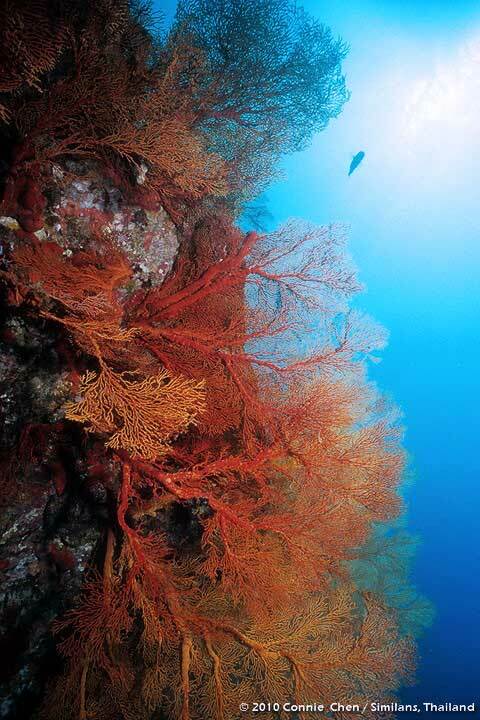 Reefs actually rival old-growth forests in terms of the years they represent. While corals form the backbone of reefs, the reefs are not a one-man show, and they incorporate a variety of plants and animals into their framework. Coral sand is one main player. Created by the erosive force of waves and currents against limestone and animal shells, as well as by the grinding teeth of certain fish, coral sand gets trapped in openings along the reef. Encrusting coralline algae acts like glue, depositing a hard veneer of solid calcium carbonate over the trapped sand to hold it in place. Together, the encrusting algae and coral sand patch up damaged areas of the reef and help to stabilize it, especially in areas frequently hit by waves. Although reefs have similar needs and basic components, you can separate them into three categories, depending on where they form. Fringing reefs are the most common. They originate directly from the shore and develop on the outer edges of land masses, forming a border that projects outward to the sea. Barrier reefs are similar to fringing reefs in that they also surround land masses, but they form a border at a distance, with a span of water between them and the shore. 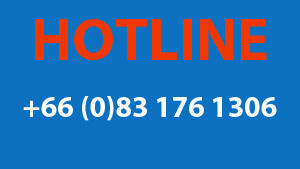 Atolls are either circular or oval and enclose a lagoon of water. They arise when a fringing reef forms around a volcano that later retreats beneath the ocean’s surface while the reef continues to grow. All coral reefs have distinctive horizontal and vertical zones created by differences in depth, wave action, current movement, light, temperature and sediment along different parts of the reef. Although the exact characteristics of each zone may vary slightly depending on the location and type of reef, all reefs have a fore reef, or seaward slope, and a back reef. The back reef is the part of the reef closest to shore, while the fore reef is farther out to sea. If you were scuba diving and swimming away from land, you first would encounter the reef flat, a relatively shallow zone of the back reef located closest to the shore. The flat’s shallow waters experience wide variations in temperature and salinity and contribute to the accumulation of sediments. These factors, along with occasional exposure during lowtides, tend to limit coral growth on this section of the reef. Despite the scarcity of coral, this section supports the most species in the entire reef ecosystem. Clams, oysters, worms, crabs and lobsters dominate. Depending on the type of reef, the reef flat may be anywhere from 33 yards (30 meters) to several thousand yards in length. The reef flat has little coral but its shallow waters teem with life.After you marveled at the marine life in the reef flat, you’d notice the reef starting to slope upward, forming the reef crest. As the highest point of the reef this zone is also exposed at low tide. Unlike the reef flat, however, it is on the outer side of the reef, so it receives the full brunt of the waves. Encrusting algae are prevalent here, busy repairing the constant damage caused by the waves. Where the waves are tamer, strong branching corals grow closely together to better tolerate the crashing seas. Marine animals take shelter in the crevices of the crest, which usually spans between 3 yards and 55 yards (2.7 meters and 50 meters). If you crossed over the crest and headed farther out to sea you would enter the buttress zone, which falls on the outer part of the fore reef. If you were looking to see some sharks or barracudas during your dive, this would be the zone to spot them. The coral reef here is characterized by spurs, or buttresses, of coral that jut out from the wall. In between the spurs are deep grooves, or channels, that help to mitigate the force of oncoming waves by channeling spent waves back out to sea where they collide with oncoming waves, thus canceling out their strength. The grooves also drain sediment off the reef. Finally, you would approach the outermost seaward slope and the reef wall. Although this zone receives less light because of its greater depth, from about 22 yards to 44 yards (20 meters to 40 meters), you would find the greatest number of coral species congregating here because of the reduced wave activity. Beyond that, though, sediment buildup increases and reef-building corals become sparse. Each zone of a coral reef is unique, and together they make up one of the most diverse and productive ecosystems on earth. The coral reef’s zooxanthellae, or symbiotic algae, give it its color. When coral is stressed, it expels the algae and loses its color in a process called bleaching. Coral reefs are vulnerable to a variety of stressors. Even a one degree rise in temperature can damage coral, causing it to expel its symbiotic algae in a process known as coral bleaching. 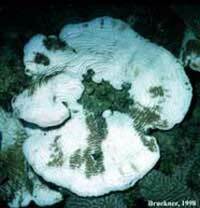 It’s called bleaching because the algae is what gives coral its color. Without it, the coral takes on a stark white appearance. If the stress is prolonged, the algae will not return, and the coral will die. The strong massive waves from storms like hurricanes and cyclones frequently damage reefs. The waves easily break off or flatten large portions of coral reefs. Along with storms, natural weather patterns like El Nino can negatively affect corals. The increased ­temperatures, altered salinity and increased rainfall are all stressors — lengthy periods of cold rainy weather tend to suppress coral growth. Coral has its share of predators, too. Crabs, marine worms, snails and barnacles all prey on coral polyps, destroying even their underlying limestone structure and making it impossible for future polyps to recolonize. One of corals’ most colorful fish enemies, the parrotfish, is familiar to many divers who can immediately identify it by the characteristic chomping noise it makes as it eats away at the coral. Perhaps corals’ greatest enemy, however, is humans. Not only are humans likely responsible to some extent for the rising water temperatures that cause coral bleaching, but fishing methods, pollution and even seemingly unrelated actions like deforestation harm coral. Fishing can be problematic for several reasons. Overfishing impacts coral by removing key species from the marine food chain. The methods used to catch fish can also be devastating. Cyanide fishing, for instance, is used by more than 15 countries and involves dumping cyanide onto reefs to stun fish for easy gathering. The cyanide poisons not only the fish but also the reef. Some fishermen also engage in blast fishing, or using explosives to stun fish. The explosions rip corals apart and cause nearby colonies to bleach. More than 40 countries allow blasting. In addition, sediment runoff from farms, construction and deforestation can kill corals by clogging their mouths or by blocking sunlight. Likewise, pollutants and sewage entering the water increase the nutrients on which harmful algae and other coral competitors thrive, and increased competitors means less space for coral. Mining operations that scrape away at the reefs for limestone to use in road and building materials are bad news, too. Even well-meaning tourists and scuba divers may threaten reefs by taking “souvenirs” home with them or by inadvertently kicking the fragile reef with a fin. Fortunately, many groups are coming to the reefs’ rescue by stepping up research and conservation efforts. More reefs are being designated as marine protection areas, some countries are enforcing stricter fishing oversight and some environmental organizations even give you the option of “adopting” a reef. Gray, William. “Coral Reefs and Islands.” Singapore: David & Charles. 1993. Sammon, Rick. “Seven Underwater Wonders of the World.” Thomason-Grant. 1992. Texas A&M University. “Ocean World: Coral reefs.” March 2, 2007. Zell, Len. “Diving and Snorkeling Great Barrier Reef.” Lonely Planet. 2006. HowStuffWorks, Inc.